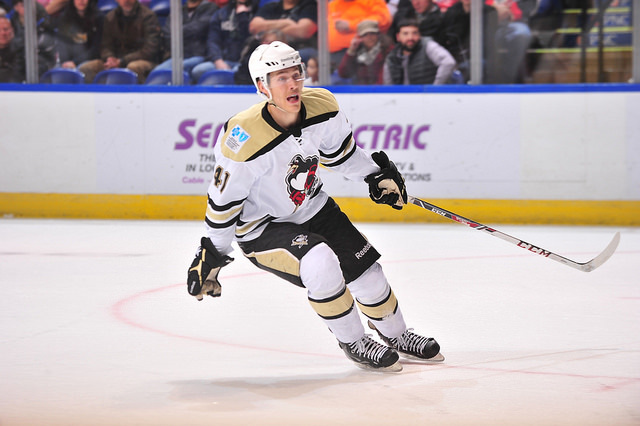 That described Carter Rowney's night yesterday, as he put up 3 goals in the Wilkes-Barre/Scranton Penguins' 5-4 victory against the Hershey Bears. Putting up an even strength goal, a shorthanded goal, and a power play goal, one may say that Rowney has a pretty great game. But this isn't the only time he's been outstanding. In fact, Carter Rowney has had a phenomenal 2015-16 AHL campaign in light of the call-ups of Scott Wilson, Conor Sheary, Kevin Porter, Tom Kuhnhackl, et cetera. In 58 games, Rowney currently has 17 goals and 22 assists for 39 points on the season - this is already a career high for him. As previously said, however, Rowney has made the best of a bad situation for WBS, with all the call-ups Pittsburgh has had to make in light of injuries to the likes of Eric Fehr and Beau Bennett. Over his last 15 games, Carter Rowney now has 8 goals and 7 assists for 15 points. Has been one of the #WBSPens best over the last month. This season of Carter Rowney, albeit 4 years older, is very reminiscent of Conor Sheary's season last year. Both were never drafted into the NHL, both were signed as free agents to the Wilkes-Barre/Scranton Penguins, and both are having phenomenal seasons in the final year of their AHL contracts. So, this begs the question: will Rowney's off-season mirror that of Sheary's as well? Will Carter Rowney also receive an NHL contract at season's end, just as Conor Sheary did? Well, we'll find out? In the meanwhile, let's continue to watch Rowney's resurgence.